Before :- A. Gopal Reddy, J. Wife living in India - Wife receiving telephonic threats from her husband living in America - Criminal case under section 506 IPC rightly registered against husband in India. Offence committed by an Indian Citizen outside the country - It would be deemed to have been committed in India - Police in India can register the case and investigate. For the Petitioner :- Mr. C. Padmanabha Reddy, Senior Counsel and Mr. C. Praveen Kumar, Advocate. For the Respondent No. 1 :- Mr. Nooty Rama Mohan Rao, Advocate. For the Respondent No. 2 :- Public Prosecutor. A. Indian Penal Code, Sections 3 and 4 - Indian Penal Code, Section 506 - Criminal Procedure Code, Section 188 - Territorial Jurisdiction - Offence by N.R.I. - Husband living in America - Wife living in India - Wife receiving telephonic threats from her husband in India - Police in India registering a case against husband under Section 506 IPC - Not illegal - Offence would be deemed to have been committed in India without any corporeal presence of the accused. B. 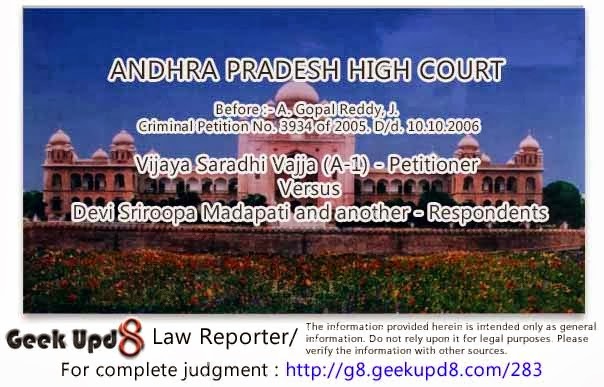 Criminal Procedure Code, Section 188 - Indian Penal Code, Sections 3 and 4 - Territorial Jurisdiction - Offence committed by an Indian Citizen outside the country - It would be deemed to have been committed in India - Police in India can register the case and investigate - No prior sanction of Central Govt. is required for investigation - Sanction would be required when Police submits charge-sheet before the Magistrate and initiates an enquiry. 1993(3) RCR(Crl.) 34 (SC) relied. D. Surender Reddy v. State of A.P., 2002(1) ALT (Crl.) 419 (A.P.) : 2002(1) ALD(Crl.) 351. Paruchuri Ashok Kumar v. State of A.P., 2004(2) ALT(Crl.) 146 (A.P.) : 2004(1) ALD 196. Shaik Kusrouddin v. State of A.P., 2005(1) RCR(Criminal) 948 : 2005(1) ALT(Crl.) 132 (A.P.). State of U.P. v. Lakshmi Brahman, (1983)3 SCC 372. H.N. Rishbud v. State of Delhi, AIR 1955 SC 196. State of M.P. v. Mubarak Ali, AIR 1959 SC 707. State of U.P. v. Bhagwant Kishore Joshi, AIR 1964 SC 221. Ajay Aggarwal v. Union of India, 1993(3) RCR(Criminal) 34 : (1993)3 SCC 609. A. Gopal Reddy, J. - By means of filing this petition under Section 482 Cr.P.C. petitioner seeks to quash the proceedings in Cr. No. 410 of 2004 of Banjara Hills Police Station, Hyderabad initiated against him for the offence under Sections 498-A and 506 IPC. The complainant lodged a complaint alleging that her marriage was performed with the petitioner-A-1 on 16-8-1995 and they lived happily in USA for 8-1/2 years and had a son-Raviteja on 6-4-2000; petitioner developed illegal contact with Anju Kapoor for the last 3 years and tortured her both mentally and physically since then. He threatened for her life and targeted her son in his vicious threats and blackmailed her in every aspect and coerced to sign a custody decree and also a divorce, which he has later used to get married to Anju Kapoor. He also threatened that if she did not sign the papers, he would drag her to the US Courts, which is a very expensive affair. He also took possession of her passport and blackmailed that he will not give the same until she signed the divorce papers. She signed those documents under great pressure and mental agony. The same happened in USA where she had no support from family or friends. In view of the same, she had to leave the States and came to Hyderabad to protect herself. Her mother-in-law-Pramila Vajja, who resides in Siddam Setty Apartments, Ashok Nagar, Hyderabad made threats that petitioner-A-1 will take the child with him and he can visit Hyderabad at any time. Apart from the same, she has been receiving calls from the US Consulate in this regard for the past few days. Therefore, she requires protection from the petitioner and her in-laws. On the basis of the said complaint, police registered the above crime for the offence under Sections 498-A and 506 IPC and proceeded with the investigation, which is now sought to be quashed on the ground that the complaint under Section 498-A IPC is inconsistent with her application filed in the Family Court for restitution of conjugal rights and it was filed only with a view to prevent the petitioner from participating in the proceedings before the Family Court filed by her for child custody and restitution of conjugal rights under the threat of his arrest whenever he visits India. The complainant made wild allegations against the petitioner and his mother, whereas in the civil proceedings she has stated that she wants the petitioner to live with her as husband. By an order dated 6-4-2005 in FCAMP No. 79 of 2005 in FCA No. 33 of 2005 this Court was pleased to permit the petitioner to visit the child, if he comes down to India any time before the date of final hearing of the appeal. In view of the same, continuation of investigation is nothing but harassment and liable to be set aside. Further, the allegation of wild harassment was in USA and they never lived together in India much less Hyderabad and relate to the period prior to decree of divorce obtained on 4-1-2004. Since she is no more a wife on the date when the complaint was lodged, continuing the proceedings is nothing but abuse of process and liable to be quashed. 3. Sri C. Padmanabha Reddy, learned senior counsel appearing for the petitioner would contend that once the marital relationship is severed between the petitioner and the complainant, registering the crime for the offence under Section 498-A IPC is nothing but abuse of process. 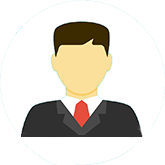 Petitioner being a qualified and established I.T. professional with executive responsibilities and working in a Multi National Company and also acquired citizenship of United States of America in 2003, without prior sanction of the Central Government as contemplated under proviso to Section 188 Cr.P.C., police cannot register the crime and investigate into the matter. The complainant who came along with the child to India on 11-6-2004 filed O.P. No. 326 of 2004 in the Family Court to appoint her as sole guardian of her minor son, which is in violation of consent decree passed by the Circuit Court. Since the petitioner and his son are American citizens, the Courts at USA alone will have jurisdiction in respect of matters relating to child custody; on petitioner moving the Circuit Court, it passed a decree on 18-6-2004 directing the complainant to return the minor child to the petitioner at his residence in Virginia, which resulted in maliciously instituting the above complaint which is nothing but abuse of process and liable to be quashed. 4. Sri Nooty Ram Mohan Rao, learned counsel for the 1st respondent (as he then was) contended that under Section 498-A IPC which has been inserted by Act 46/83 the word 'woman' is used but not 'wife' and Section 4 of IPC extends to extra-territorial offences committed by any citizen of India in any place without and beyond India and once the offence committed outside India, will be treated as if committed in India as per the explanation to the Section. Even otherwise, on the date of offence alleged to have committed the relationship of wife and husband subsists and police can investigate into the same and lay the charge-sheet. In support of his submission, he placed reliance on the judgments of this Court in D. Surender Reddy v. State of A.P., 2002(1) ALT (Crl.) 419 (A.P.) : 2002(1) ALD(Crl.) 351, Paruchuri Ashok Kumar v. State of A.P., 2004(2) ALT(Crl.) 146 (A.P.) : 2004(1) ALD 196 and Shaik Kusrouddin v. State of A.P., 2005(1) RCR(Criminal) 948 : 2005(1) ALT(Crl.) 132 (A.P.). He further contended that FIR registered by the police cannot be quashed at the initial stage and prayed for dismissal of the petition. 5. Before considering the rival contentions, the facts which are not in dispute have to be noticed are : That the petitioner married the complainant on 6-8-1995 and since then they lived in USA where a male child was born on 6-4-2000; later differences arose between the parties; the spouses approached the Circuit Court of Fairfax Country, Virginia, USA and obtained a final decree on 14-1-2004; while granting divorce the said Court permitted the father and mother to share the custody of the child; the father became a citizen of America in the year 2003 i.e. three years after the birth of the child and consequent upon the divorce, the mother, not being a citizen of America, returned back to India along with the child and later filed O.P. No. 326 of 2004 under Section 9 of the Guardians and Wards Act, 1980 seeking custody of the child, in which petitioner filed I.A. No. 845 of 2004 under Order 14 Rules 1 and 2 r/w 151 CPC to try the issue of jurisdiction and maintainability of the O.P. as a preliminary issue. On dismissal of the said I.A. petitioner filed FCA No. 33 of 2005 wherein this Court by order dated 24-2-2006 dismissed the appeal with a direction to the Family Court to dispose of the O.P. filed by the complainant expeditiously. Pending the above proceedings it appears that the petitioner obtained a decree on 18-6-2004 wherein the Circuit Court directed the complainant to return the minor child to the petitioner at his residence in Virginia, which triggered the filing of the complaint. 6. This Court cannot go into the validity of the consent decree obtained by the petitioner, suffice it to say that the 1st respondent/complainant had not brought to my notice of her filing any O.P. to nullify the consent decree passed by the Circuit Court nor it is disputed that the petitioner has acquired American citizenship in the year 2003. 7. The issue that falls for consideration is : "Whether the bar contained in proviso to Section 188 Cr.P.C. is also extended to investigation ?" 8. Before I proceed to answer the question it is convenient to consider the judgments on which reliance is placed. 9. This Court in the case of Surender Reddy (supra) refused to quash the proceedings since the charge-sheet does disclose commission of offence under Section 498-A IPC. 10. This Court in Paruchuri Ashok Kumar's case (supra) held that Offences arising under Section 498-A IPC and the provisions of Dowry Prohibition Act would usually be committed at the place of residence of the husband and his parents and also at the place of residence of the parents of the wife, as it is the parents of the wife that have to meet the demand for dowry by the husband and his relatives as their demand would have to reach the parents of the wife for its being met. Having regard to the peculiar circumstances, this Court in exercise of jurisdiction under Section 407 Cr.P.C. transferred C.C. No. 393 of 2003 pending on the file of V Additional Metropolitan Magistrate, Guntur to the Court of IX Metropolitan Magistrate, Hyderabad. 11. In the case of Shaik Kusrouddin (supra) this Court held that merely because divorce was obtained the marital crimes, if any, committed by the husband during the subsistence of the marriage do not get vanished. If divorce is the panacea for marital crimes, or crimes committed by the spouses, many marriages may not subsist and refused to quash the proceedings. 12. The judgments on which reliance is placed do not answer the contentions raised by the learned senior counsel, namely, petitioner being an American citizen cannot be subjected to inquire into or to be tried in India except as contemplated under proviso to Section 188 Cr.P.C. Provided that, notwithstanding anything in any of the preceding sections of this Chapter, no such offence shall be inquired into or tried in India except with the previous sanction of the Central Government." Corresponding old law. - Section 188 of the Code of Criminal Procedure, 1898. Section 188 only deals with procedure and does not make it a substantive offence to do an act, which would be an offence if committed in India. It confers extra-territorial jurisdiction in respect of offences committed outside India by Indian citizens whether on the high seas or elsewhere or (b) any person not a citizen of India on any ship or aircraft registered in India. It is a corollary to Section 4, Penal Code and is its procedural counterpart and Section 188 are extra-territorial in their operation in a restricted sense. "Section 3 : Any person liable by any Indian law to be tried for an offence committed beyond India shall be dealt with according to the provisions of this Code for any act committed beyond India in the same manner as if such act had been committed within India. (2) any person on any ship or aircraft registered in India wherever it may be. Explanation :- In this Section the word "offence" includes every act committed outside India which, if committed in India, would be punishable under this Code". "Inquiry means every enquiry, other than a trial, conducted under this Code by a Magistrate or Court." "Investigation includes all the proceedings under this Code for the collection of evidence conducted by a police officer or by any person other than a Magistrate who is authorized by a Magistrate in this behalf." "Under Section 207, the Magistrate is performing a judicial function of ascertaining whether copies have been supplied or not, it would undoubtedly be an inquiry for the purpose of satisfying himself that Section 207 has been complied with in letter and spirit. That satisfaction has to be judicial satisfaction. It is not a trial but something other than a trial and being judicial function it would necessarily be an inquiry. The making of an order committing the accused to the Court of Session will equally be a stage in the inquiry and the inquiry culminates in making the order of commitment. Thus, from the time the accused appears or is produced before the Magistrate with the police report under Section 170 and the Magistrate proceeds to enquire whether Section 207 has been complied with and then proceeds to commit the accused to the Court of Session, the proceeding before the Magistrate would be an inquiry as contemplated by Section 2(g) of the Code. We find it difficult to agree with the High Court that the function discharged by the Magistrate under Section 207 is something other than a judicial function and while discharging the function the Magistrate is not holding an inquiry as contemplated by the Code". 17. In view of the same, "inequity" relates to proceedings before Magistrate prior to trial, while "investigation" is confined to proceedings taken by the police or by any person other than a Magistrate who is authorized in his behalf. The object of an investigation is the collection of evidence and of an inquiry the taking of evidence for further action. Investigation consists generally of - (i) Proceeding to the spot; (ii) Ascertainment of facts and circumstances; (iii) Discovery and arrest of suspected offender; (iv) Collection of evidence which may consist of (a) examination of persons (including accused) and recording statements if thought fit, (b) search of place and seizure of things; (v) consideration whether the materials are enough for submitting a charge-sheet before the Court. (See H.N. Rishbud v. State of Delhi, AIR 1955 SC 196; State of M.P. v. Mubarak Ali, AIR 1959 SC 707; State of U.P. v. Bhagwant Kishore Joshi, AIR 1964 SC 221). A police officer investigates a case by himself or under the order of a Magistrate under Section 202. In view of the same, the word 'inquiry' used in proviso to Section 188 Cr.P.C. is confined to proceedings before the Magistrate prior to trial alone but cannot be extended to 'investigation' by the police. The bar, if any, will operate to inquiry before the Magistrate after the police laid the charge-sheet for the offence. 18. In Ajay Aggarwal v. Union of India, 1993(3) RCR(Criminal) 34 : (1993)3 SCC 609, Justice K. Ramaswamy in his separate judgment held that sanction under Section 188 is not a condition precedent to take cognizance of the offence. If need be it could be obtained before trial begins. Justice R.M. Sahai while concurring the above view held that language of the section is plain and simple. It operates where an offence is committed by a citizen of India outside the country. Requirements are, therefore, one - commission of an offence; second - by an Indian citizen; and third - that it should have been committed outside the country. Substantive law of extra-territory in respect of criminal offences is provided for by Section 4 of the IPC and the procedure to inquire and try it is contained in Section 188 Cr.P.C. Effect of these sections is that an offence committed by an Indian citizen outside the country is deemed to have been committed in India. Proviso to Section 188 Cr.P.C. however provides the safeguard for the NRI to guard against any unwarranted harassment by directing, "that, notwithstanding anything in any of the preceding sections of this Chapter, no such offence shall be inquired into or tried in India except with the previous sanction of the Central Government". Since the proviso begins with a non obstante clause its observance is mandatory. But it would come into play only if the principal clause is applicable, namely, it is established that an offence as defined in clause (n) of Section 2 of the Cr.P.C. has been committed and it has been committed outside the country. 19. It was nextly argued that the petitioner acquired American citizenship in the year 2003, therefore, prior sanction of the Central Government is must. 20. It is not in dispute that police registered a case for the alleged offence under Sections 498-A and 506 IPC. The allegations in the complaint go to show that the petitioner was making threats to the complaint telephonically through his friends and family; he also threatened that he will take the child with him and he can visit India at any time for the said purpose, she is receiving calls from the U.S. Consulate in this regard for the past few days. 21. It is implicit under Section 3 of the Penal Code that a foreigner who commits an offence within India is guilty and can be punished as such without any limitation as to his corporeal presence in India at the time. For if it were not so, the legal fiction implicit in the phrase "as if such act had been committed within India" in Section 3 would not have been limited to the supposition that such act had been committed within India, but would have extended also a fiction as to his physical presence at the time in India. (See Mobarik Ali Ahmed v. State of Bombay, (AIR 1957 SC 857)). "...The position is quite clear where the representations were made through the trunk phone. The statement of the appellant at the Karachi-end of the telephone becomes a representation to the complainant only when it reaches cognition of the complainant at the Bombay-end......Now there can be no doubt that prima facie the Indian Penal Code is intended to deal with all unlawful acts and omissions defined to be offences and committed within India and to provide for the punishment thereof of the person or persons found guilty therefore. This is implicit in the preamble and Section 2 of the Indian Penal Code. What is, therefore, to be seen is whether there is any reason to think that a foreigner not corporeally present at the time of the commission of the offence does not fall within the range of persons punishable therefore under the Code. It appears to us that the answer must be in the negative unless there is any recognised legal principle on which such exclusion can be founded or the language of the Code compels such a construction". 22. In view of the law as aforementioned once the allegations in the complaint disclose that threats were received telephonically at India and crime is registered for the offence under Section 506, it is not desirable to scuttle the investigation at the prime stage. 23. Since no other grounds have been urged for staying the investigation, there is no bar for the police to investigate into the crime registered for the alleged offence and filing of charge-sheet. On filing the charge-sheet only when the Magistrate proceeds to make an inquiry into the matter, having regard to the nature of allegations, petitioner can insist for sanction of Central Government for collection of evidence during the course of trial into the charges so framed. 24. For the reasons abovementioned, this Court is not inclined to scuttle the investigation into the crime by the police. The petitioner is entitled to raise all the grounds during the course of inquiry by the Magistrate before trial commences. 25. The Criminal Petition is accordingly dismissed.